A new video for Rebellion’s co-op shooter, Strange Brigade, has been summoned into existence and shows off quite a bit more than the last one, along with some commentary from the developers. For more co-operative hijinks, check out the best co-op games on PC. Strange Brigade pits a secret group of agents working for the British government against hordes of undead and magical creatures across the world. 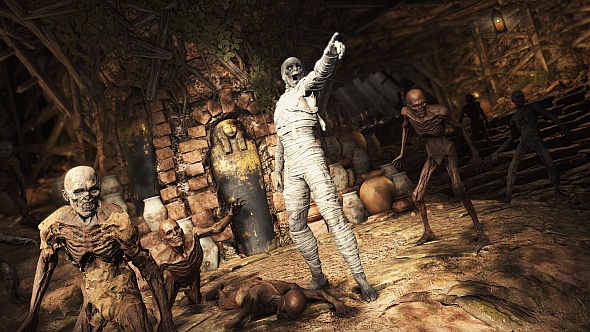 In the demo, a pair of these agents fight off hordes of mummies as they attempt to steal an ancient artefact. It looks less like Left 4 Dead and more like Killing Floor – silly and over-the-top rather than tense and spooky. But, unlike those games, there’s a greater focus on the environment, like traps and hazards that can be used to the team’s advantage. Some of the special abilities were shown off too, like Gracie’s ability to draw enemies towards her. Other notable takeaways include the mention of secrets and light puzzles, changing gear at workbenches, and different enemy types – like a High Priest who can summon mummies and wrap the agents up in magical linen. It’s not a good thing, though. It’s evil linen.